It’s spring time! If you’re anything like me, you’re already imagining all the ways you can brighten up your living/work space, and recenter on what’s important to you. For me, this year has brought changes not only in my home (moving into a new apartment with my boyfriend, his ten-year-old, and his dog) but a shift in focus from what’s easy and convenient to what’s actually healthy for my body. A little over a year ago, I made the jump to all-natural haircare products. From there, it’s been a steady switch to naturally-based, chemical free products for cleaning, washing, eating—everything! As it’s time for spring cleaning (which to me is a mixture of physically scrubbing down all the surfaces in my house while simultaneously getting my life together) I’m excited to share some of my favorite products. These products (plus a few life tips) will not only get your home/office clean, but help you detoxify your entire life. 1. This nifty towel rod that promotes airflow and reduces bacteria. Are you aware of just how much bacteria is lingering on your towel? Yeah, me either! Until I heard of Airfold. Bacteria grows when there’s a combination of three elements: warmth, moisture, and organic material. Put those three things together and you’ve got a typical bathroom. Yuck. The Airfold Towel Rod is honestly the smartest (and easiest) addition for your bathroom/room/dorm. It takes up the same space as a traditional rod or bar, but is designed in a way that increases airflow, reducing the dry time by up to 40%! It comes in a classic silver color, too, to match any space. Definitely a must-buy for your spring cleaning and bathroom updating! 2. A doormat that absorbs your every wet or dirty step. Honestly, your door mat is pretty disgusting. Not only has this become the catch-all place for dirt and dust, but it’s where every house guest wipes off their feet (or paws). You have no idea what’s truly on that thing! 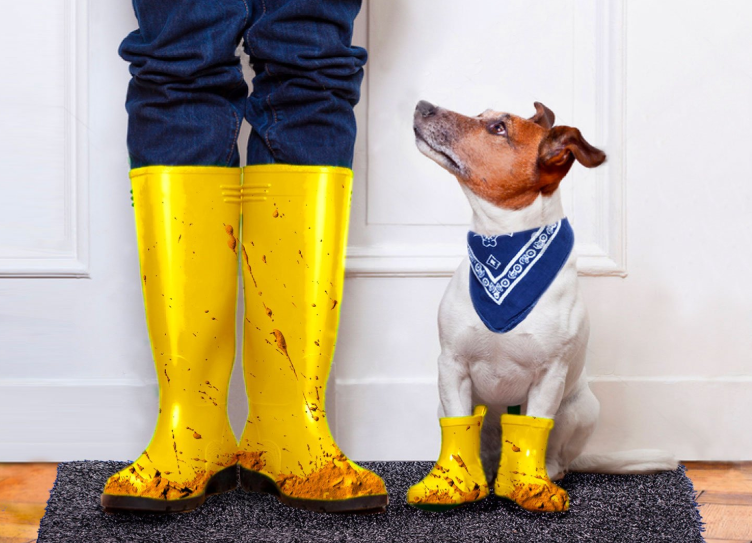 To prevent the spread of bacteria into the floors of your house, hose-off (cold water is best!) and air dry your mats. It’s also a good idea to vacuum on both sides (especially for indoor mats) to get the dirt that’s been trapped along the sides. If you’re looking for a major home upgrade, try this super absorbent ‘dirt-trapper’ door mat. This cotton and microfiber mat traps and absorbs dirt. 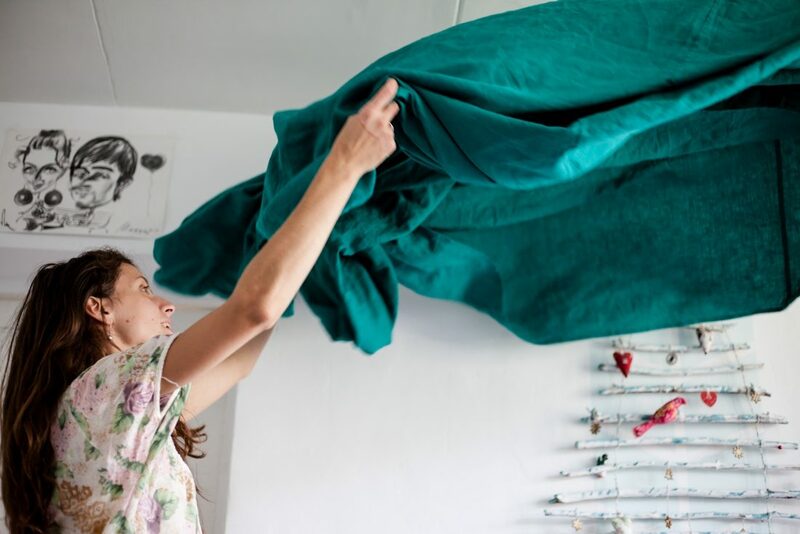 It’s for both indoor and outdoor living and it’s washable (which is honestly the best)! 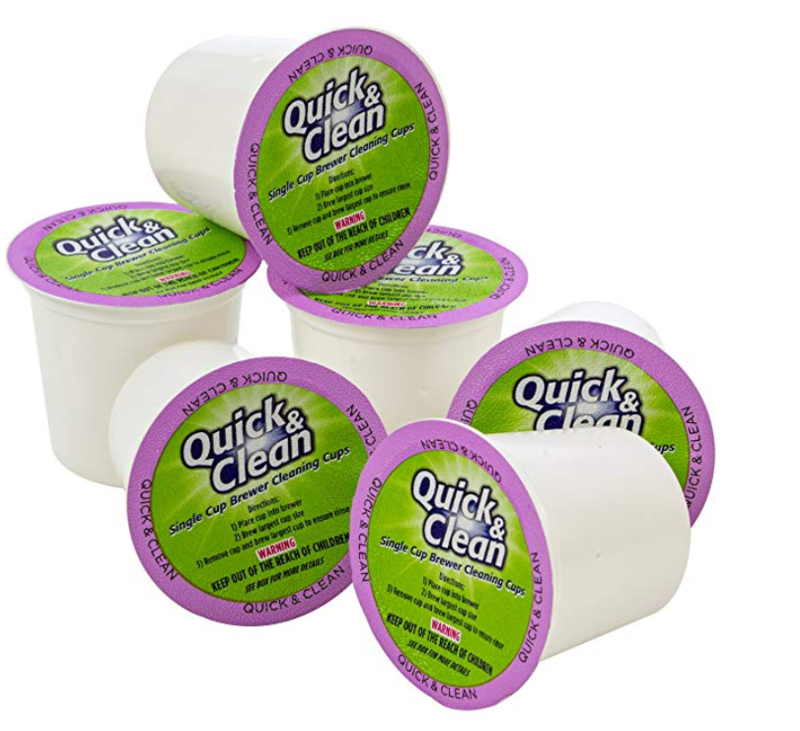 Okay, be honest: when was the last time you cleaned your Keurig? 4. A scent that will keep the spring cleaning vibes all year long. I’ve been big into all natural scents lately. Not only are these better for you (less carcinogens and harmful chemicals being inhaled) but they also last longer. I first smelled an Archipelago scent at my friends house several months ago. Whenever I walked through her kitchen, this smell was so prevalent, even after several hours! I love having a good smelling home, and good smells go hand-in-hand with spring cleaning. That’s why I invested in one of these in my bathroom and kitchen and honestly, it’s made a world of a difference. 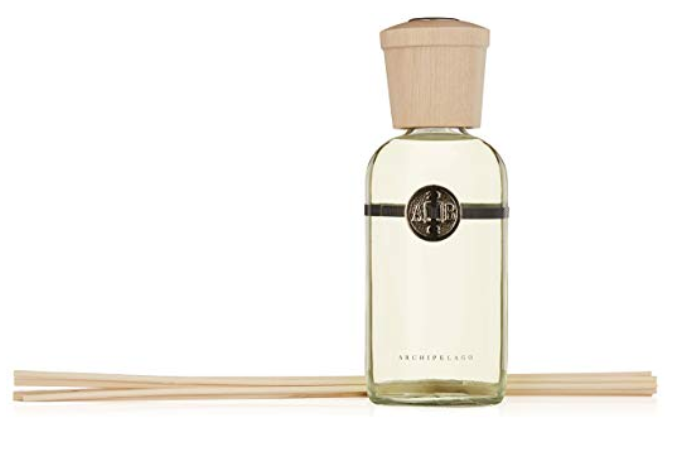 There are also a bunch of different fragrances, which is great if you’re someone who likes switching things up after several months, or if you prefer to have different scents in different areas. I’ve been on a natural kick for the past year, especially now that I live with a small human (aka: my boyfriend’s son). As I’ve really researched different products and their harmful chemicals, I’ve been turned away from the things I used to call ‘normal’ in an effort to use more naturally-based, non-toxic products. When you clean, you need to get the job done. You can’t compromise on quality, but safety is an utmost priority. That’s why I love the Method line of cleaning products! 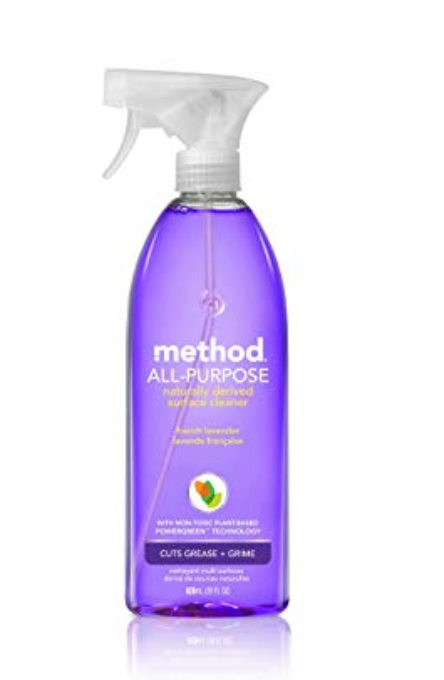 Using non-toxic and biodegradable ingredients, this cleaner can work on glass, wood, tile, stone, countertops, etc. I’m definitely a fan. 6. 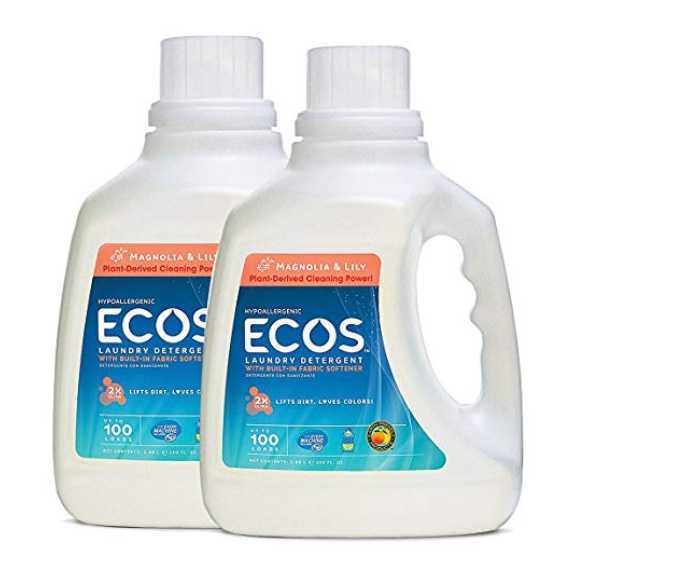 Upgrade your laundry with this earth-friendly detergent. This brand is also hypo-allergenic, which is great for someone like me with sensitive skin. It’s also pH-balanced, which is something I’ve been paying more attention to as a woman. 7. Sulfate-free dish soap for cleaner, safer dishes. I’ll be the first to admit that before my natural kick and looking for all naturally-based products, I never really thought about what soap I was putting on my dishes. It’s crazy to think about it, though, because our dishes and utensils are things we put directly in our mouths—having something chemical-free should be an utmost priority! 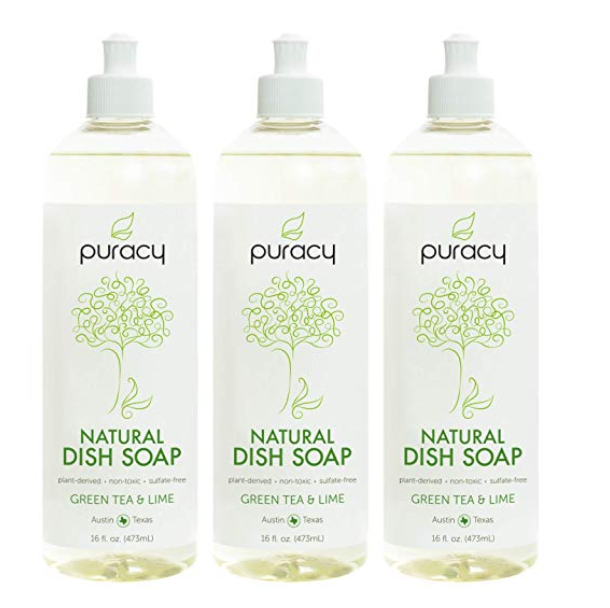 This Puracy dish soap is one of my absolute favorites. It’s gluten-free, biodegradable, non-toxic, and hypoallergenic. It smells exactly like it’s advertised—green tea and lime—and it does a great job cleaning without irritating my skin (I’m an avid dish glove-wearer!) or leaving residue on the dishes. 8. Airtight containers for food storage and organization. 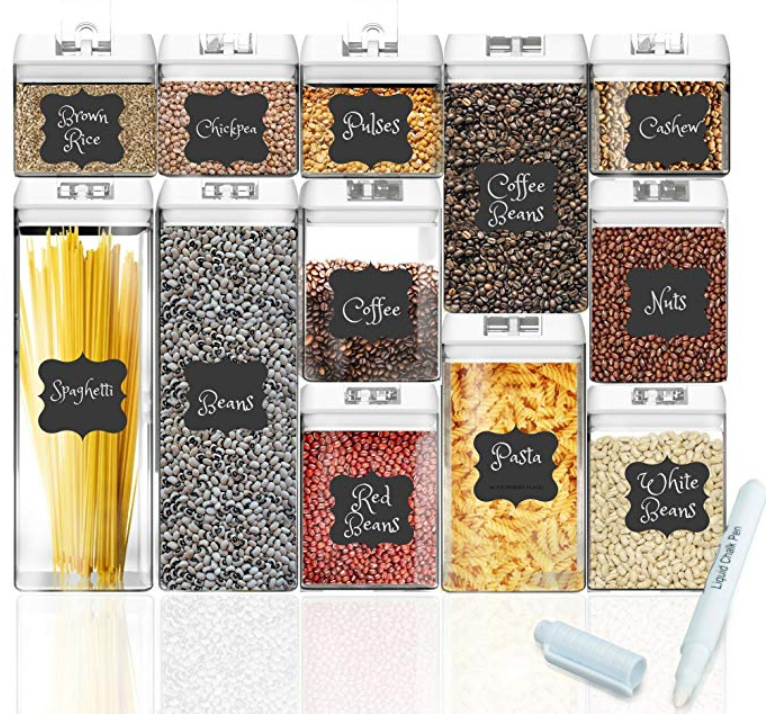 If you’re thinking about completely spring cleaning your pantry, then this set of food storage containers is the way to go. Not only are these containers adorable, but you can customize them with the included labels and chalk pen (and erase them whenever you want to switch things up). The containers are BPA-free! Yay! And they come in different sizes. They have interchangeable easy-lock lids, too, which are secure enough to stay in place and keep food fresh, but are simple enough to use (even for kiddos!). 9. 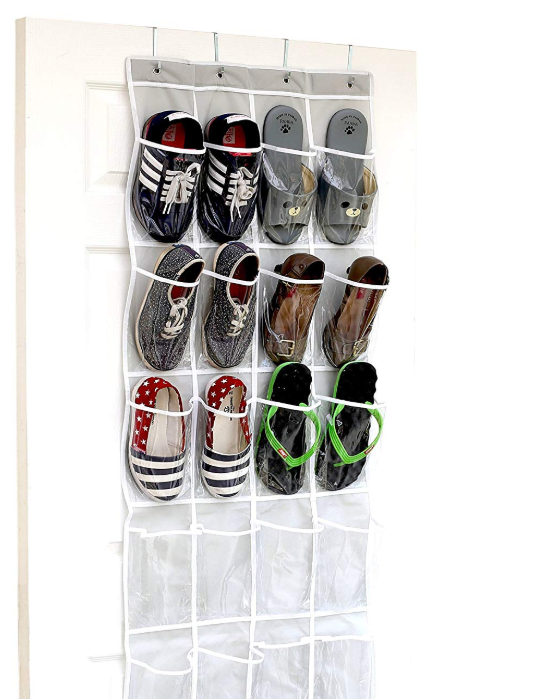 An over-the-door shoe hanger to keep your footwear organized. Whether or not you’re a shoe person, this spring cleaning shoe hack is a game changer. And it’s super cheap, too. For $8 you can purchase one of these hanging shoe racks. This will help keep your shoes in one place without having to stuff them somewhere where you can’t see what they are (which is the worst). PRO TIP: Before buying this one, I had a hanging shoe rack that displayed the shoes horizontally. That was a definite no-go. With the vertical shoe rack, all your shoes can be displayed without worrying about anything slipping out if you over-stuff or move a pair’s position. You can also double-stuff a single spot, too, with something small like flip flops! These are just a few of my favorite products, but the spring cleaning doesn’t have to stop with there! As you go through different rooms in your home, start thinking about what you can part ways with. Marie Kondo style, think about what truly resonates with you. If there are old hair products you don’t use, for example, consider donating them. When I made the switch to natural hair products and started using Monat, I did a giant purge of old things I used to use and that felt like such a relief. Take the time to go through your clothes and shoes, too. If there’s something you haven’t worn in over six months, it might be time to donate. Research places in your community that you can give to: women’s groups, Goodwill, shelters, or something that’s meaningful to you. Also, start spring cleaning your friendships and relationships. If you feel like you’ve been dragged down by a person or your connection to him/her, start distancing yourself. And above all, remember that true ‘spirit-cleaning’ starts within. As you work on cleaning your life, work on your heart. Are you being a positive person? Spreading good energy? Living aligned to your beliefs and goals? Spring cleaning season can be an opportunity to change your entire life. Get started!